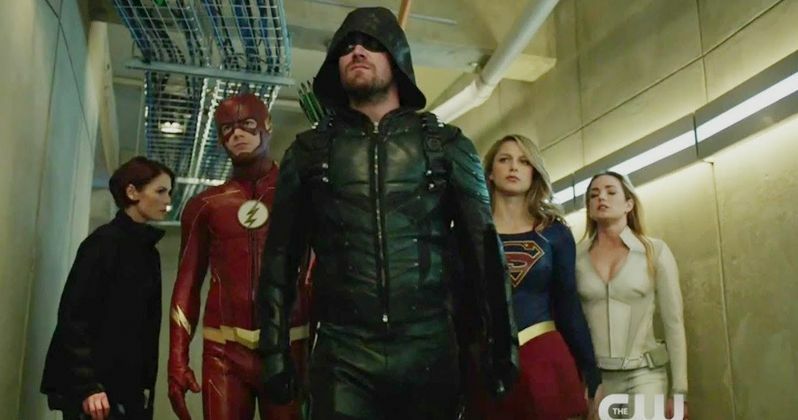 With just a few weeks left until the Arrowverse crossover Crisis on Earth-X, The CW has released the first brief trailer and a plot synopsis for this epic two-night event. The footage doesn't reveal too much, but this Crisis on Earth-X trailer shows some of your favorite CW heroes together, like Arrow (Stephen Amell), Flash (Grant Gustin), Supergirl (Melissa Benoist), White Canary (Caity Lotz), and Alex Danvers (Chyler Leigh), although with a few quick action shots. Thankfully, The CW's plot synopsis goes into much greater detail, as you can see below. "Barry (guest star Grant Gustin) and Iris's (guest star Candice Patton) wedding brings the gang together, but things go awry when villains from Earth-X attack the ceremony. All of the superheroes band together with help from their super friends like Citizen Cold (guest star Wentworth Miller), The Ray (guest star Russell Tovey), Felicity Smoak (guest star Emily Bett Rickards), Iris West and Alex Danvers (Chyler Leigh) to take on their most formidable villains yet. Earth's mightiest heroes, Green Arrow (guest star Stephen Amell), Supergirl (Melissa Benoist), The Flash (guest star Grant Gustin) and White Canary (guest star Caity Lotz), lead their teams into battle to save the world." This crossover is a nod to the numerous "crisis" events held throughout the DC Universe since the Crisis on Infinite Earths comics introduced the concept of the Multiverse. The Crisis on Earth-X poster that was revealed in September featured a surprising addition, the DC character known as The Ray, who hasn't appeared in the live-action Arrowverse yet, although he was featured in The CW digital series Freedom Fighters: The Ray. It has long been rumored, but this synopsis confirms that Russell Tovey, who voices The Ray on the digital series, will star as the live-action version of The Ray as well, which could also set up other appearances in the Arrowverse. Unlike past CW crossovers, this year's four-partstory will air over two nights, Monday, November 27th and Tuesday, November 28th on The CW. Last year's crossover was spread out over four nights, with each show, Supergirl, The Flash, Arrow, Legends of Tomorrow airing in their respective time slots, but this time the crossover is being approach more as two, two-hour movies that air over a two-night crossover. Arrow moved to Thursday nights this season, but for the crossover it will air on Monday at 9/8c after Supergirl, while the other DC shows will remain in their regularly scheduled time periods. As we get closer and closer to this crossover happening, hopefully we'll get to see even more footage, both of these heroes in action, and of Barry and Iris' long-awaited wedding. It will be interesting to see if this two-night crossover is more appealing to fans than four back-to-back episodes of these heroes teaming up together. It doesn't seem that there will be a second crossover this year, like last year, when Supergirl and Flash teamed up for a musical crossover, but Arrow star Stephen Amell has been talking about wanting to put together a Supernatural crossover, although it seems unlikely that will ever happen. Take a look at the Crisis on Earth-X trailer below, courtesy of The CW Network.